Kimball’s showroom is an extremely unique showroom experience for those that are shopping for furniture for a variety of different business environments. This fantastic furniture showroom is filled with well-crafted furniture that provides not just aesthetic appeal, but also comfort and durability. 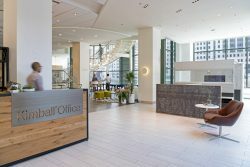 Kimball has showrooms all over the country, including an amazing facility in Chicago. All of their facilities showcase a variety of furniture that allows companies to truly customize their workspace. Kimball has won multiple awards throughout the years, including the 2018 Interiors & Sources Readers’ Choice Award for Furniture. Kimball also prides itself on its sustainable approach. This is because they are committed to not just their customers, but also the environment. If you are looking to buy some furniture to replace furniture in your office, or you are interested in redesigning your office from the ground up with stylish new furniture, Kimball’s showroom is the right place for your needs.